Emma made this picture and I just love it. She explained that they are good fairies, fixing things to keep everyone happy. 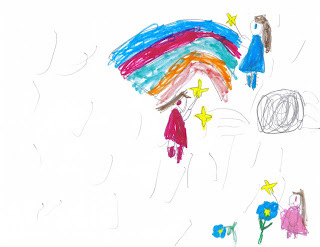 The first fairy is turning the raindrops into a rainbow, the second is turning the meteor into a shooting star, and the third is fixing a wilting flower. I love the hard work she put in, the care she took in coloring--and the fact that she knows the word meteor! Today is Emma's fifth birthday. I simply can't believe she is this old! We have had a child (or several!) under five since 1995...it's really hard to contemplate the fact that I am now moving into a new era of motherhood. No more babies, toddlers, or preschoolers--moving into homeschooling all four of my kids in a few short weeks. I have to admit that I shed a few tears today, thinking about the fact that all my babies are growing up. I know, five is far from grown--but it feels huge! My sweet girl is already so grown up. In the past few months she has learned to swim, to read, and her drawings have done that big leap that allows you to see what she means to depict rather than having to guess. She is waiting for her Kindergarten work, so happy to be included with the big kids, with her own notebook and plans for each day. She sits in an armchair listening to music and I can see the teenager she will one day become. It really is amazing. We've had a great day. Matt worked from home this morning, and Emma opened her gifts with everyone around. She got stuffed bobblehead dogs on a bed that she's been asking for, some tiny fairy dolls, an art set and a tote bag with matching sunglasses and binoculars. She and Julia immediately took off with a huge fairy adventure in the yard and inside, complete with houses made of cherrywood blocks. After lunch, we headed to a play date with friends, where we played all afternoon and had chocolate cupcakes we'd made. The kids had a blast and the moms talked mostly homeschooling stuff--the usual late August conversations. Emma got 3 more Webkinz, courtesy of Rachel and Ben, who insisted on going shopping for gifts with me while Matt made dinner even though I told them she really didn't need any more gifts! They of course made Emma very happy, and she is already thinking about playing with them in the morning. We have a busy weekend ahead--a pool party tomorrow afternoon, which includes Rachel and Julia sleeping over afterwards, and we're hoping to go to the beach on Sunday--if Hurricane Bill cooperates, anyway. Today is also the third anniversary of moving into our house, which we also are grateful and happy for. It's a good life. I can't believe that Ben was born seven years ago today! If having kids has taught me anything, it's that all the old ladies I used to hate--you know the ones, they pinch cheeks and exclaim how fast you've grown up--were absolutely correct. Time flies, babies grow and before you know it they are gap-toothed kids with scabs on their knees who know how to tell time and multiply and write in cursive. Of course I still remember being pregnant, I still remember the day he was born, how his neck smelled, how he looked up at me with his big brown eyes, his tiny mouth always nursing. I still remember him learning how to sit, how to crawl, how to walk. I still remember how he'd say "Wa yelcome!" rather than "You're welcome!" I still remember how he was fascinated by Matt's boss and friend Tony when he was a toddler. Matt and Tony played softball on the same team and we'd go watch the games--Ben was fascinated, and eventually decided that his name was Tony, too. If I'd call him Ben, he'd say, "Me not Ben, me Tony!" If I asked him if he was hungry, he'd say, "Me not hungry--me Tony!" And now he's at the age of reason, playing chess, loving math, knowing all the trivia a boy's head can hold. Of course I am happy to see him growing up so well-- but at the same time I have to admit a twinge of sadness to see my boy get bigger every day! Rachel went out with a friend, so Julia, Ben & Emma played one of their super duper pretend games until our friends came over to play, bringing ice cream cookie sandwiches and some wonderful gifts, including a handmade mobile for Ben with a knight and castle theme--she drew each of us as knights, with Ben as the commander, of course. He loves it, and we've put it on the chandelier over the dining room table for people to enjoy for the next few days/weeks (we'll see how many times we bump into it!) Then Julia and her friend had a library program, so Rachel stayed with Ben & Emma and we mamas went to the library and had a nice hour chatting while the girls did their thing. By the time we got home, Matt was right behind us, so Ben opened the rest of his gifts. We went out for Indian food at a new restaurant in town, which I jokingly say Matt tricked him into....the kids like Indian food, but it probably wouldn't be their first choice of cuisine. However, I mentioned to Matt that this restaurant opened, and soon after told Ben he'd need to decide what he wanted for his birthday dinner--if I needed ingredients I'd need time to get to the grocery store, after all. We don't always go out for birthdays, because often the kids will want something like homemade pizza, spaghetti and meatballs, or the absolutely fabulous homemade Chinese dumplings that we make...but if they say they want to go out, we usually will. Well, Matt then asked Ben if he wanted to try the new Indian place, and Ben, being Ben and pretty agreeable, said "Sure!" We had a feast--naan, dal, chicken tikka, lamb biryani, chicken kebabs, salad, mango lassis, basmati rice galore....they even brought out dessert for us (which we hadn't ordered) of a sweet coconut rice with golden raisins and plums. We were stuffed--but still managed to find room for a bit of birthday cake when we got home! Ben chose vanilla with strawberry frosting, which I improvised, making buttercream and using strawberry jam that we made in June after strawberry picking. All in all, I think Ben had a fun birthday. And he and Emma are very lucky, because they usually get to celebrate three times--once on their actual days, once when our friend Jenn visits from North Carolina and we have a kid birthday party, and once when we have the extended family for a big party and barbecue. Seven years old.....happy birthday to my sweet, sweet boy! How is it possible for summer to go by faster than the other three seasons combined? I demand that someone get on this problem for me.....seriously, I haven't been blogging much lately. Part of it I can blame on Facebook--I talk to friends all day there and they see my updates constantly, so this blog, which began as a way to keep far-off friends and relatives apprised of our lives here, has become less necessary. One of the problems I have with blogging is that I make a mental note of events I want to write about, but then life is so busy that I don't make the time to write it down, and then new events pile up and before I know it I don't know what to write about! So, in a nutshell, we have been really, really busy! Building the tree house, scraping wallpaper and painting the living room and dining room, swimming and seeing friends, having house guests, attending programs and events all over the place, Emma and Ben both learning to swim without any floaties, Emma learning to read, Julia going to science camp, Rachel getting a lap top with money she's earned babysitting, trying to plan lessons for all four kids come September....it's been a whirlwind. And looking ahead to August doesn't lend me much in the way of peace and quiet, either. Favorites? Going into NYC as a family and playing all day at the Central Park Zoo and Victorian Gardens (an amusement park set up in Wollman Rink every summer now), though the trip via the LIRR was something we'll never bother with again! Adventureland, a new summer tradition. Beach days, pool days. Seeing Kelly and Collin, finally back from Okinawa after 3 years stationed there (we haven't seen David yet!) A day in Port Jefferson with Amie, Evelyn and Sadie, which began with seeing a play at Theatre 3 with 20 or so other friends. Time in the tree house. Seeing "Guys & Dolls" performed in Mattituck with Matt after a lovely and romantic dinner at the Old Mill Inn on the water. Seeing "Harry Potter 6" with the whole family, and "My Sister's Keeper" with Rachel and Amie. Greenport with Grandma Barbara, where we rode the carousel as always but then took a sail on "Glory," a lovely electric boat--and all 4 kids got to drive! Planning....Ben and Emma's birthdays and the annual family barbecue at our house. Jenn and the kids visiting from NC. A trip to the Bronx Zoo, our first in several years. A camping trip, if we can EVER see a weather forecast with no rain in sight! The library's "Battle of the Books," where Rachel is the team captain. A trip to the Baiting Hollow Hummingbird Sanctuary. Seeing "The Wizard of Oz" at the Gateway Playhouse. This is what I mean by a whirlwind! I don't want immortality through my work....I want to achieve it through not dying!